Time “moves,” and “moves fast.” Human experiences “can’t last.” We leave the past behind with fondness or regret, approaching an uncertain future with eagerness or with dread. Time seems to flow endlessly from one moment to the next. And the flow of time seems to always be in one direction: toward the future. But that may not be right. Discoveries over the last century have shown that much of what we think about time may be nothing more than an illusion. Contrary to everyday experience, time may not flow at all. Our past may not be gone; our future may already exist. Greene is certainly correct that the nearly universal belief among working physicists today is that we have no way of making sense, within physics, of the passage of time. But how can that be? Physics tells the story of how the world at one time changes into the world at another time. But its language for doing so works quite differently from that of poets and songwriters. It was Einstein’s development of the Special Theory of Relativity in 1905 that forced physicists into a recognition of how alien was the concept of the flow of time to the rest of physics. Until Einstein, it appeared to most physicists that the most natural way to picture the universe is as a set of objects in three-dimensional space as they exist at one moment. As time passes, the three-dimensional universe changes. What exists is three-dimensional – all things as they are at some particular time. 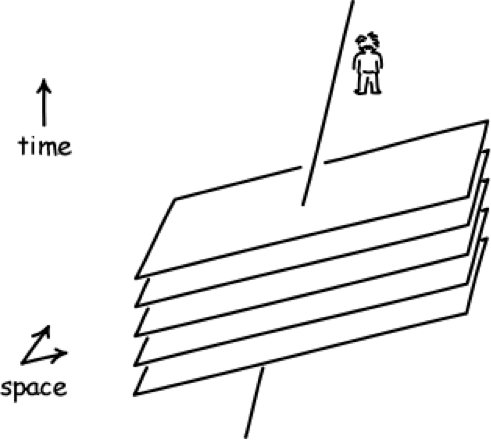 The figure above (drawn by Prof. John D. Norton of the University of Pittsburgh, used with permission) is a version of a “spacetime diagram.” In it, two of space’s three dimensions are drawn in perspective as horizontal planes. Instead of the third spatial dimension, the up-down direction represents time; later times are shown higher up in the diagram. 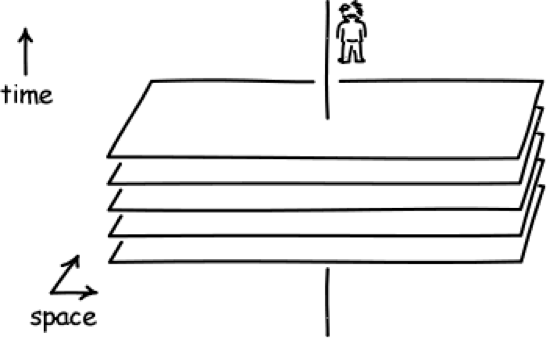 In this particular spacetime diagram, a person is standing in one place. The vertical line, called his “worldline,” shows his location at every moment. The common-sense view that reality is everything that exists at a given moment of time would be illustrated by a single one of the horizontal planes (standing in for all three space dimensions) at a time; reality at later times is represented by a plane higher in the spacetime diagram. Here is where Special Relativity’s most radical idea comes. Einstein showed us that different observers of the universe have every reason to disagree with each other about which happenings are happening at the same time, and there’s no way to say who is right. This idea is represented by this second spacetime diagram. It shows the world as it appears to a second person who is moving to the right (as seen by the person in the first spacetime diagram.) We can tell that person #2 is moving to the right because his worldline is tipped toward the right as you go upwards in the diagram – he’s further rightward at later times. This means that there’s no universally-correct way to select a set of happenings all across the universe and to assert that those events happened at the same time. Each way of describing the universe at a given moment is equally valid. And therefore, Einstein teaches us that reality can’t consist just of a set of things as they are at some given time – the concept “as they are at a given time” just doesn’t have any genuine universal meaning. The objective world simply is, it does not happen. In Weyl’s description, the whole history of the universe (and everything in it) is just there, without any special time to call Now, and thus without an objective boundary between past and future. In its essence, the universe is four-dimensional, not three-dimensional. We have to consider reality as the whole of the spacetime diagram of the universe, all of space through all of time. There’s simply no way to think of the universe as a whole passing from one state to another. But how is this consistent with our experience? This is the key question, for which physics simply does not have a good answer. Physics gives a perfectly full and complete description of what happens and how it happens – merely denying the “happeningness” of it all. Can physics be right about time? How can physics be right about time? Or, if we grant that physics is right, in some important sense of “right”, can that be the whole story? Another early 20th century thinker, the French philosopher Henri Bergson, didn’t think so. In his day, Bergson was a world-renowned philosopher with a mass following, much as Einstein became a decade or two later. Also like Einstein, Bergson too was awarded the Nobel Prize. (Einstein won the 1921 Nobel Prize in Physics, Bergson the Nobel Prize in Literature in 1927.) It is a shame that Bergson’s voice isn’t so well heard these days; among his ideas are some that are still very well worth attending to. Bergson’s philosophical work was broad, and I can’t do justice to all of it. But I would like to highlight what he had to say about time. He believed that what he called “la durée” (which is usually translated verbosely into English as “lived duration”), is an essential feature of the world. When he learned what Einstein’s Special Theory of Relativity had to say about time, Bergson was convinced that it couldn’t be true. For a while, Bergson was Relativity’s most outspoken opponent. For Bergson, our experience of lived duration was a key example of how essential it was to include human experience (or, in his term, “intuition”) in any complete account of the world. He was convinced, even before Relativity, that physics failed to provide a complete world picture precisely because it was based on objective measurements alone, without including experience. This inner life may be compared to the unrolling of a coil, for there is no living being who does not feel himself coming gradually to the end of his role; and to live is to grow old. But it may just as well be compared to a continual rolling up, like that of a thread on a ball, for our past follows us, it swells incessantly with the present that it picks up on its way; and consciousness means memory. This is great stuff, anticipating fellow Nobel Laureate Bob Dylan’s description of time by the better part of a century. But did it mean that Einstein had to be wrong when, two years later, he announced to the world his own new understanding of time? Bergson certainly thought so. He set about trying to find Einstein’s error. But there was no error. Einstein’s insights into physics have stood the test of time, over and over again. The objective world simply is, it does not happen. Only to the gaze of my consciousness, crawling along the lifeline of my body, does a section of this world come to life as a fleeting image in space which continuously changes in time. So what are we, as human beings, to make of the enigma of time? I’ve found some remarkable insights in the writings of the great Jewish theologian Abraham Joshua Heschel. In the first half of the 1950’s, Heschel wrote three books that still challenge readers today: The Sabbath and Man is Not Alone (both from 1951) and God in Search of Man (1955.) Strikingly, Heschel drew some of his most important insights from the enigmatic character of time. This might not be too surprising; after all, one of Heschel’s most famous images is that the Sabbath is a “palace in time.” But that snippet is only one example of Heschel’s intense engagement with time. Time is like an eternal burning bush. Though each instant must vanish to open the way to the next one, time itself is not consumed. Time has independent ultimate significance; it is of more majesty and more provocative of awe than even a sky studded with stars. We can only solve the problem of time through sanctification of time. To men alone time is elusive; to men with God time is eternity in disguise. […] Creation is the language of God, Time is His song, and things of space the consonants in the song. To sanctify time is to sing the vowels in unison with Him. Eternity is not perpetual future but perpetual presence. […] This is the meaning of existence: To reconcile liberty with service, to weave the threads of temporality into the fabric of eternity. To Heschel the puzzle of time, instead of being a symbol of our failure to understand the universe, serves as a profound source of religious insight. Perhaps that is the best way to confront the tension between temporality and eternity. (This post is part of Sinai and Synapses’ project Scientists in Synagogues, a grass-roots program to offer Jews opportunities to explore the most interesting and pressing questions surrounding Judaism and science. Dr. Peter Saulson is Martin A. Pomerantz ’37 Professor of Physics at Syracuse University, and is also a member of Congregation Beth Sholom-Chevra Shas in Jamesville, NY). Carlo Rovelli’s “The Order of Time” may be quite relevant here. I won’t attempt to reproduce his argument, but he concludes that one has to unpack Weyl’s “fleeting image” by understanding it as arising from human perception. Rovelli disagrees with the notion of a “block universe” but rather argues that our universe consists of events in space-time, and we force them to be ordered “in time” by our perceptual limitations.